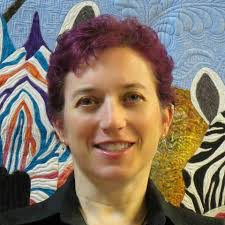 The Indiana Heritage Quilt show is please to announce our workshop faculty for the 2019 show. Read about our talented instructors here and consider signing up for a workshop when you attend our show! I create art for the wall using fabrics I have dyed, printed, and purchased. Working improvisationally --without patterns, I cut, design and stitch the pieces together until they tell me they are done. I have been sewing or quilting in one form or the other for over 20 years and have run a successful long arm business for the last nine. I have won numerous national and international awards for my quilting., most recently at AQS Phoenix, and Des Moines, 2016, and the PFAFF Master Award for Machine Artistry at the International Quilt Festival Houston, 2015. I currently live in Lincoln, NE with my husband of 24 years, Chris, and my two children William and Tony. I am a textile artist and creator of hand-dyed fabrics and threads. My pictorial art quilts are created from fused fabrics and hand-embroidered or machine quilted. My free-form embroideries share a similar style with these narrative quilts. Whimsical in nature, both textile art forms express my joy and love of creating art. I am a Quiltaholic! Not a day goes by that I am not dreaming, plotting, planning, cutting, stitching ((and un-stitching!)) on SOMETHING Quilt-Related! 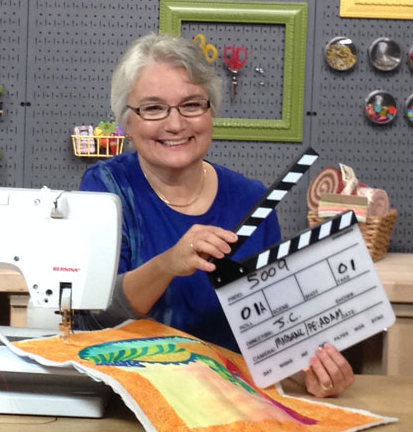 I am honored and blessed to share my love of scrappy quilts through traveling this wonderful world of ours --visiting quilt guilds and shops and giving lectures & workshops, wherever they may be.